Antiques Roadshow is a television program that was particularly popular a number of years ago, and which I believe is still running. It involves people bringing their various antiques to a traveling group of experts who tell them how much their item is worth. One of the reasons why so many people watched the show was to witness that moment when one of the experts told an unsuspecting antique owner that the lamp or end table or ceramic dog that had been taking up space in their garage for the past twenty years was actually worth a small fortune. Beyond the novelty of realizing a windfall without having to do any real work, there is much more at work here. There is just something amazing about looking at an item that you once viewed with ambivalence and seeing it anew as an object of great worth. When that item is a person, the excitement is particularly powerful. To understand this phenomenon, consider another popular television show – American Idol. There are hundreds and hundreds, probably thousands, of established singers in the world, all of whom are worthy of our time and money if we’d like to hear talented voices. But we just wouldn’t get millions of busy people to stop what they were doing twice a week to listen to them simply by putting them on television. But create an environment where we get to discover hidden talent among people who we wouldn’t normally notice if they bumped into us on the street, and we’re suddenly fascinated. Well, within the organizations where we work, there are lamps, end tables, ceramic dogs and pop stars just waiting to be dusted off and celebrated every day, and there is something powerful and exciting about being the one to take them out of the garage and dust them off or let them sing. 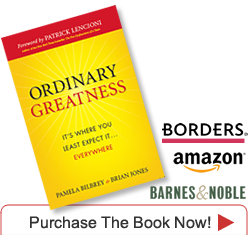 In Ordinary Greatness, Pam Bilbrey and Brian Jones explore this concept and provide a comprehensive and practical set of tools for excavating the hidden value and talent buried deep within our companies, hospitals, churches, and schools. They base their advice on their own substantial experience working with real leaders in real organizations where they’ve helped bring about excellence where others may have seen mediocrity. But Pam and Brian do something beyond helping organizations achieve more than they thought possible, though that alone is a great reason to buy and use this book. They also provide a blueprint for us to go about changing the lives of people who work for us by helping them realize their potential and become the people they are meant to be. That is certainly one of the most worthwhile endeavors that any executive or manager can undertake. It would also make for some great reality t.v.